It can be all too easy when temperatures drop to a certain (read: icy) level to lean on the same outfits you have for the past few years, huddling up in gray, navy, and black knitwear and the same black ankle boots. 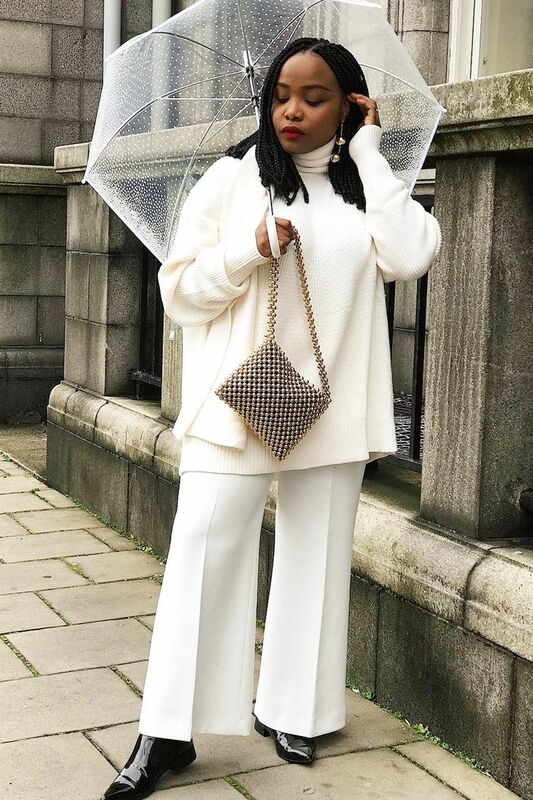 While you can't beat a classic, if you're looking for some new winter combinations, the likes of Ada Oguntodu, Linda Tol, and more have been wearing a number of practical yet still interesting looks that you too will be able to wear on repeat until spring. Many of these key items you'll already own, such as turtlenecks and classic blazers, but you can make your winter wardrobe more 2018-feeling with white boots, leopard print, and leather skirts. Scroll through the gallery to see six outfit combinations that you can lean on this winter. Style Notes: ASOS's Lotte Williams gives us a lesson in how to wear your leopard-print skirt in winter. Apparently, it's all about the low-maintenance additions. Think flat boots, baggy knits, and a biker jacket. Style Notes: Vinyl trench coats are big again this season, and we love how Tine Andrea paired hers with gold earrings, a black jumper, and cropped raw-hem jeans. Style Notes: Influencers are painting the town brown for F/W 18 and looking pretty chic while they're at it. Amy Sall makes the trend look effortless thanks to her Mango leather skirt and turtleneck top. Style Notes: If there's one thing that united the trends of 2018, it's got to be the oversize fit. Case in point: Rikke Krefting created a dramatic ensemble by belting an oversize blazer and chunky turtleneck before adding a pair of skinny-fit leather trousers. Style Notes: A colored faux fur is a surefire way to add some fun to an outfit. This Samsøe & Samsøe jacket is a great way to embrace the fluff without adding too much bulk, thanks to its shorter length. Style Notes: Heritage-check and gray suits like Linda Tol's are in demand this winter. Layer up with a turtleneck and trench coat for extra warmth. This post originally appeared on Who What Wear UK. Up next: The Best Winter Outfits to Wear When You're Bored of Your Clothes.